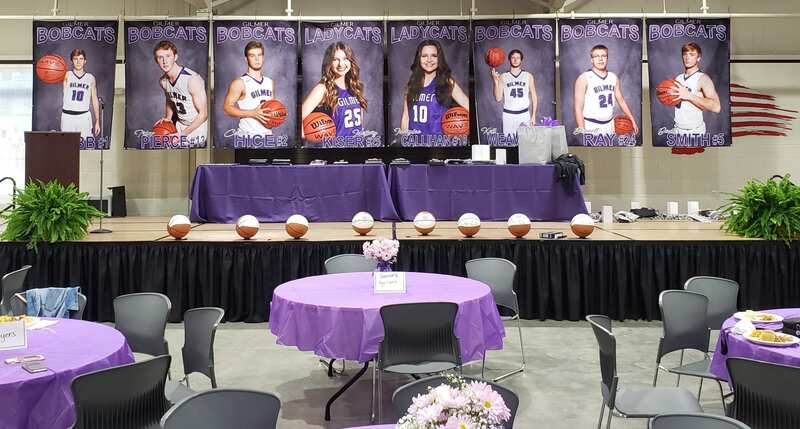 ELLIJAY, Ga.- Gilmer High School hosted its annual basketball end-season banquet on Sunday, March 24, 2019, at the Gilmer Agriculture Center & Cannery next to Clear Creek Middle School. 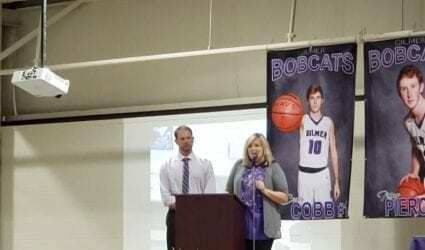 (Left to Right): Coach Hice, Coach Nunn of Gilmer High School. 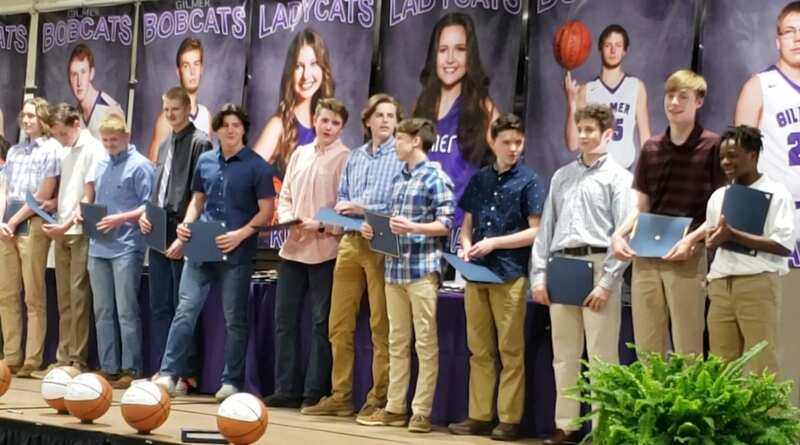 Coach Nunn presented the girls awards, while coach Hice presented the boys awards. 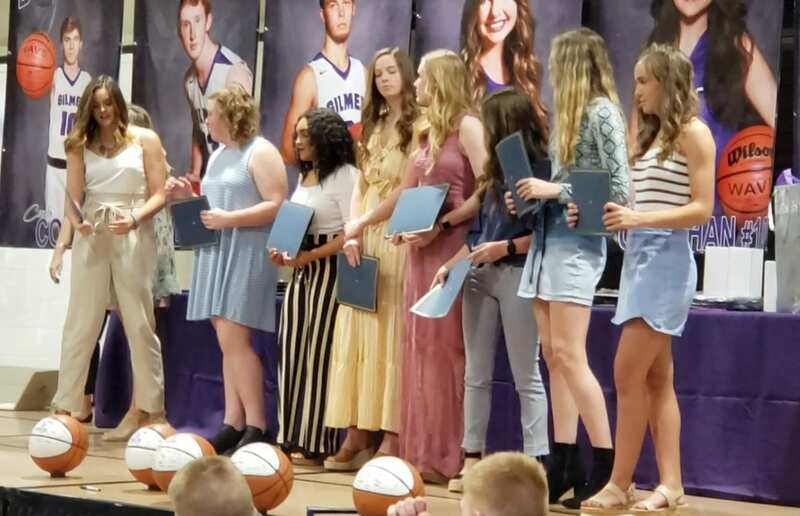 Congratulations from Fetch Your News to all who received recognition during this end-season banquet! 1:16:47: Coach awards from girls, coach awards from boys. 1:23:07: Coach awards, thanks, and closing. 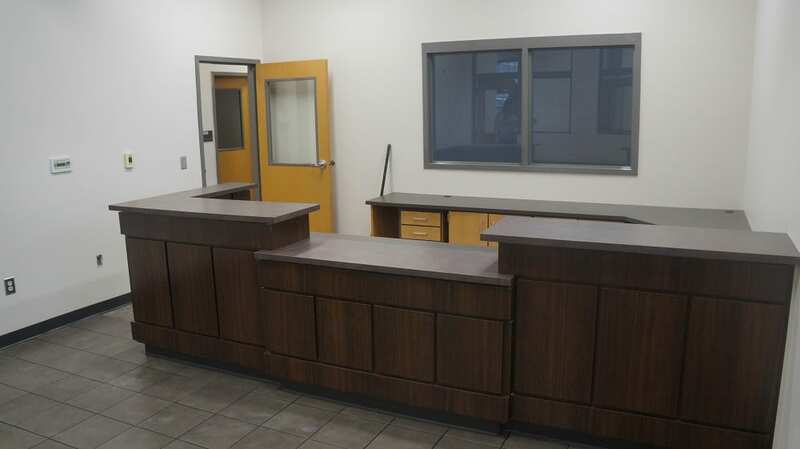 ELLIJAY, Ga. – With the majority of the renovations complete and everything ready for the students, it is confirmed that the project will not reach 100% before Tuesday’s start of term. 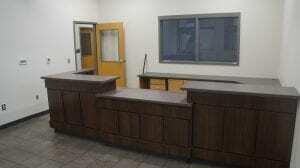 However, the project has not moved construction into classrooms and only minor details remain in student areas. During a special called meeting of the Board of Education, Gilmer County Charter Schools Superintendent Dr. Shanna Downs told the board that the biggest remaining item is that the staff furniture will not arrive before the start of school. With that said, Downs informed the board that critical staff will be in the front office utilizing a built-in desk in the front office and utilizing what they have available as opposed to moving in older furniture just to moved out again. With rising concern over the project’s student readiness, Downs assured the board that the student areas, as well as the secured, single-point entry, would be ready before Tuesday. This means some administrative faculty will utilize the school’s media center while they await the new desks and furniture. One minor setback saw relief at the meeting as well for the media center as the project survived a surprise rain during roof work. Insurance replaced the carpet after the area flooded. With the new carpet installed, the media center is already repaired and ready for use. Walking through the building certainly shows the area with a feeling of an upgrade. 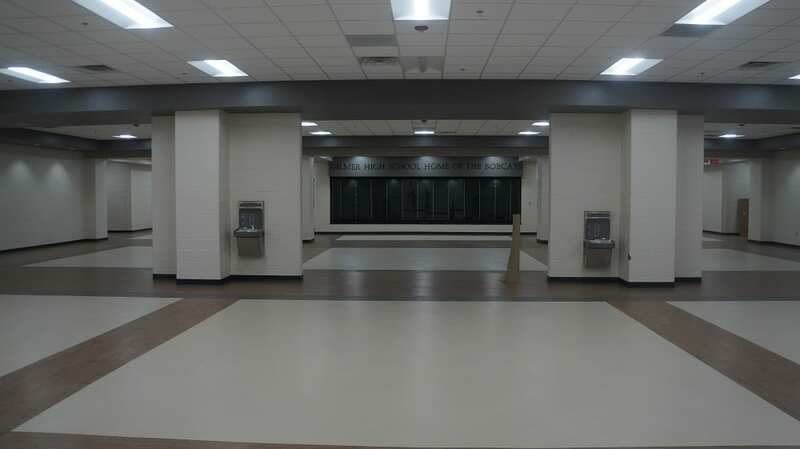 The cafeteria and commons area have combined for an open space. The commons murals are gone, but as of this point, it is not certain if the school will repaint the murals or seek a different decoration for the area. 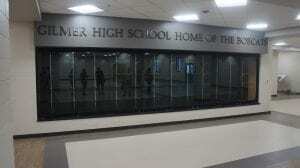 The commons area now caps with a centralized trophy case that will soon showcase all the trophies the school has acquired and those yet to come. 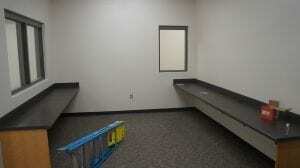 The new flooring and roofing reach throughout the administrative offices. A new administrative conference room and renovations to the nurse’s station are just two of the expansions allowed by pushing the offices forward against what used to be the glass of the entrance area. 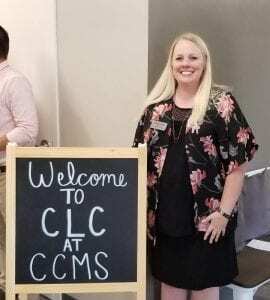 With the new single-point, secured entrance, those taking the front entrance to the school will walk right past the Linda Miller Memorial Theater into the commons area. The other hallway students and visitors are used to traveling down now reaches a dead-end just past the back edge of the media center allowing an emergency exit onto the grass. While talks continue about the next phase of renovations to come, exact plans have not been drawn, but discussion indicated a possibility to angle the corner of the media center and adding glass along the hallway, giving the media center more of an internet cafe styling. 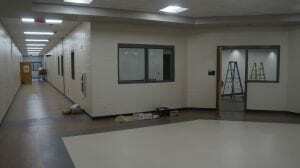 As for this year, the construction is wrapping up in the hallways of the offices and awaits the last details and finishing touches to prepare for the students’ arrival in four days. Enjoy the full album of photos on FYN’s Facebook Page. 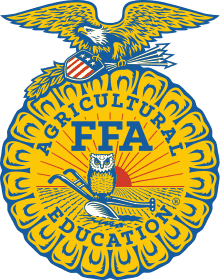 ELLIJAY, Ga. – The Gilmer County Charter School System’s chapter of the National FFA Organization (formerly known as the Georgia Future Farmer’s Association) held their banquet honoring those award winners for the year’s work. Ralston went on to note the efforts the state has put into getting the second headquarters of Amazon. He told those present that even with Amazon, agriculture would maintain its position as the number one part of our economy in Georgia. Continuing the banquet, attendees were treated to a dinner served by FFA members before the honorees were brought on stage. 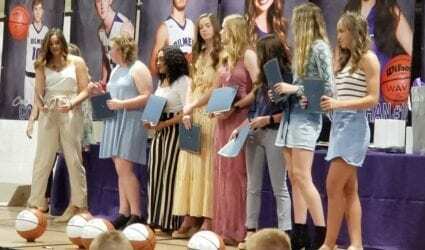 The winners noted in the banquet received their awards in the Career Development Events area and are listed below the slideshow. Gilmer High FFA (Eighth in Area) Kaytlin Beavers, Abigail Blackwell, Hunter Bowyer, Sam Dillard. Gilmer High FFA (First in Area; 10th in State) Thomas Chastain. Thomas received a $500 scholarship from the Georgia EMC for placing first in the Area I competition. Gilmer High FFA (First in Area; Eighth in State) Thomas Chastain, Eli Cochran, Bryson Mulkey (high individual), Dylan Parker. Gilmer High FFA JR (Sixth in Area) Ari Price, Avery Marshall, William McVey, Dilian Ojala. Clear Creek Middle FFA (Fifth in Area) Jacob Bertolini, Abby Bauer, Cole Parks, Sawyer Wishon. Gilmer High FFA (First in Area) Mary Lee Callihan, Mallory Kiser, Carter Hice, Nathan Cain (high individual). Gilmer High FFA JR (Third in Area) Alyssa Ashurst, Gavin Berger, Rose Chadwick, Ally Elrod, Sarah Ingle, Lauren Smith, Emma Thurman. Clear Creek FFA (Second in Area) Octavia Bushey, Macie Wilkes, Tori Reed, Abby Baurer, Natalie Johnson, Morgan Griggs, Mallory Lane. Gilmer High FFA (First in Sub-Area; Third in Area) Sara Ingle. Gilmer High FFA JR: (First in Area; Second in State) Rose Chadwick, Coleman James, Arianna Price, Lauren Smith. Clear Creek Middle FFA (Third in Area; 10th in State) Annalysa Brown, Morgan Griggs, Torri Reed, Octavia Bushey. Gilmer High FFA SR: (First in Area; Sixth in State) Mary Keener, Joe Leonnig, Shelby Nealey, Elizabeth Stillwell. Gilmer High FFA JR (Second in Area, Eighth in State) Alyssa Ashurst, Issac Bradshaw, Ally Elrod, Heath Stover. Gilmer High FFA SR (Fourth in Area) Hunter Bowyer, Mary Keener, Blake Ledford, Joseph Leonning. Gilmer High FFA (Fourth in Sub-Area) Stephanie Bailey. Gilmer High FFA (First in Area; Third in state) Bryce Bowen, Grace Henderson, Matt Long, Katie Marick. Gilmer High FFA JR (Fifth in Area) Andrea Byers, Olivia Lykins, Griselda Perez, Emma Thurman. Clear Creek Middle FFA (Third in Area) Abby Bauer, Andrew Mooney, Emma Reece, Joshua Taffin. Gilmer High FFA SR (Fifth in Area) Jalynn Ledford, Abriana Mccollum, Allison Ross, Claire Stanley. Gilmer High FFA JR (Third in Area) Colby Barnes, Rose Chadwick, Chandler Clayton, Ally Elrod, Isaiah Hopper, Sara Ingle, Clayton Ott, Heath Stover, Emma Thurman. Clear Creek Middle FFA (Fifth in Area) Samuel Mclaughin, Logan Chadwick, Jacob Jenkins, Hanna Rutledge, Kingston Collier, Sawyer Wishon, Andrew Mooney, Trace Duncan. 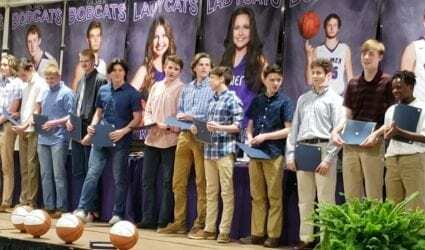 Gilmer High FFA SR (Sixth in Area) Brentney Clemmons, Alex Edens, Blake Ledford, Grant Ledford, Joe Leonnig, Nate Mooney, Mason Penland, Elizabeth Stillwell, Caleb Waddell. Gilmer High FFA JR(First in Area; Fifth in State) Rose Chadwick, Ally Elrod, Alyssa Ashurst, Sara Ingle. Clear Creek Middle FFA (Fifth in Area) Abby Bauer, Jacob Bertolini, Sawyer Wishon, Imogen Reeves. Gilmer High FFA SR (Fourth in Area ) Sadie Bryan, Carter Ott, Bryson Smith, Caleb Waddell. Clear Creek Middle FFA (11th in Area) Jacob Bertolini. Gilmer High FFA JR (11th in Area) Rose Chadwick, Clayton Chandler, Sean Lewis, Lauren Smith. Clear Creek Middle FFA (Fourth in Area) Sarrah Mclemore, Jacob Jenkins, Jacob Bertolini, Dacey Motes. Gilmer High FFA SR (Fifth in Area) Eli Cochran, Colin Reece, Taylor Sellers, Bryson Smith. Gilmer High FFA (Second in Area; Fifth in State) Samantha Dillard, Mary Keener, Jaylynn Ledford. Gilmer High FFA JR (Fifth in Area) Isaiah Hopper, Coleman James, Clay Ott. Gilmer High FFA SR (Second in Area; Sixth in State) Madison Jenkins, Jacob Jones, Billie Marie Sullens. Gilmer High FFA SR (First in Area; Fourth in State) Stephanie Bailey, Brentney Clemmons, Summer Davis, Stephen Madalo. Clear Creek Middle FFA (Fourth in Area) Andrew Mooney, Daniela Montes, Jasmine Rafael, Hannah Rutledge. Gilmer High FFA (First in Area and STATE WINNER) Bryce Bowen, Grace Henderson, Madison Jenkins, Matt Long, Katie Marick, Bryson Smith. They will represent the state of Georgia at the National FFA Convention this October in Indianapolis, Indiana. Gilmer High FFA JR (14th in Area) Colby Barnes, Clayton Chandler, Isiah Hopper, Jacob Nelson. Clear Creek Middle FFA JR(Fifth in Area) Laney Hensley, Emma Reece, Cole Parks, Samuel Mclaughin. Gilmer High FFA SR (Third in Area) Alex Edens, Jacob Jones, Samuel Parks, Billiemarie Sullens. Gilmer High FFA JR (Fourth in Sub-Area) Ari Price. Gilmer High FFA SR (Third in Sub-Area) Elizabeth Chesser. Gilmer High FFA JR (Second in Area; Eighth in State) Issac Bradshaw, Clay Ott, Heath Stover. Clear Creek Middle FFA (Seventh in Area) Sawyer Wishon, Lilly Penland, Larz Fowler, Jacob Jenkins. Gilmer High FFA SR(Third in Area) Grant Ledford, Nathan Mooney, Mason Penland. Sara May will be attending the University of North Georgia after she graduates from Gilmer High School. She will be majoring in business administration. 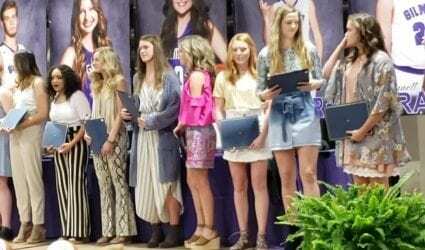 Brentney Clemmons will be attending Young Harris College after she graduates from Gilmer High School. She will be majoring in environmental science. Grant Ledford will be attending Truett McConnell University after he graduates from Gilmer High School. He is undecided at this time. Stephanie Bailey will be attending Kennesaw State University after she graduates from Gilmer High School. She will be majoring in international business. Samuel Parks will be attending the University of North Georgia after he graduates from Gilmer High School. He will be majoring in avian science. Alex Edens will be attending the University of North Georgia after she graduates from Gilmer High School. She will be majoring in agribusiness. Joe Leonning will be going to the Naval Academy after he graduates from Gilmer High School. He will be studying to become an aircraft mechanic. Megan Bird will be attending Abraham Baldwin Agricultural College after she graduates from Gilmer High School. She will be majoring in agricultural education. Elizabeth Stillwell will be attending Abraham Baldwin Agricultural College after she graduates from Gilmer High School. She will be majoring in agricultural education. Rachel Waddell will be attending Young Harris College after she graduates from Gilmer High School. She will be majoring in early childhood education. Bryce Bowen will be attending the University of Georgia after he graduates from Gilmer High School. He will be majoring in pre-med. Katie Marick will be attending Reinhardt University after she graduates from Gilmer High School. She will be majoring in math education. Grace Henderson will be attending Oglethorpe University after she graduates from Gilmer High School. She will be majoring in biology/pre-med. ELLIJAY, Ga. – The Gilmer High School (GHS) Marching Band is looking to replace their uniforms after 13 years of use. The legacy of the current uniforms stretches across over a decade of champion level performances, nation-spanning shows like Hollywood for the Christmas Parade, and growth into new avenues, such as this year’s inaugural Winter Guard Competitive Season. After all the events these uniforms have been showcased at, the time has come to hang up the old and ring in the new. Director of Bands Joe Pflueger has worked since November on finding the new look and gauging interest of both band members and Band Boosters members. Originally engaging three companies for design bids and ideas, Pflueger has finally come to a definitive design. Noting the resemblance of the front design to that of our iconic mountains, he said he has decided on the final design from Fruhauf Uniforms, Inc. 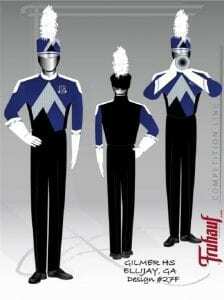 The competition line uniform will bear the school’s emblematic G as seen in the photo. Achieving this goal, however, is something the band team is still working towards. 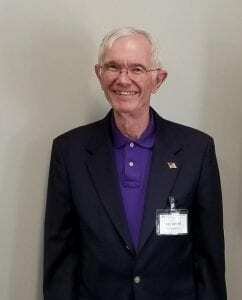 Pflueger took time to speak with FetchYourNews (FYN) saying he felt the new uniforms, along with the board’s August approval for replacing percussion instruments, bear a rewarding feeling for the students after the constant work and successes in recent years. The uniforms are more than just a new design for some though. Band mom Bobbi Leigh Mullins said it represented the chance to have her son “sparkle and shine” as he marched for the band. Consisting of 130 musicians, the GHS Band has always grown from support from its band boosters, support from the school and school board, and support from the community to further its efforts. Pflueger spoke with FYN confirming that the band has already raised half of the funds necessary to purchase the uniforms. However, if they are to meet their hopes of fielding these uniforms at the opening show next season, this fall, they need to garner another $30,000 to finish the project. 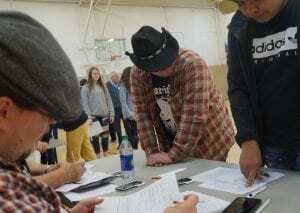 Attempting to raise the necessary funds, the band has turned to its community for help. An official release from the organization has offered game-time announcements and program recognition for sponsorship at different “star levels.” Each level represents a part of a uniform up to “5 Star” level at $395 for a full uniform. 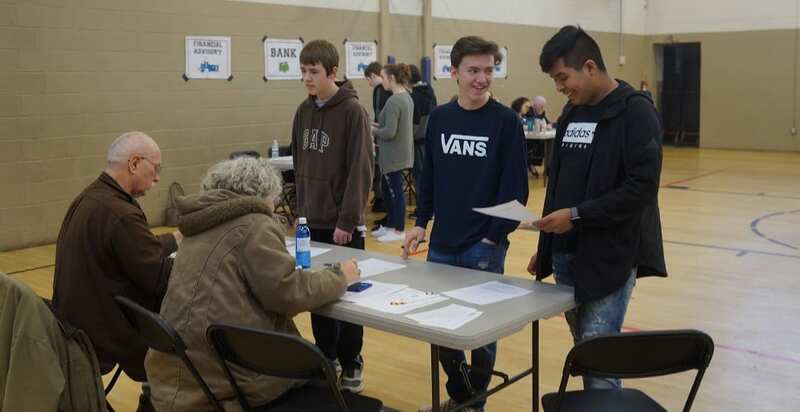 ELLIJAY, Ga. – Sophomores of Gilmer High School (GHS) were treated to the annual Reality Day that is put on every March. Sophomores from GHS make decisions about cell phones and activities among others at the Entertainment station of their budget process. Set 10 years into the students’ future, the day sets up budgetary needs for a student offering randomized “life-situations” like number of children, marital status, and job description and pay. They take this monthly income and travel to different stations in order to budget their life and what they want including cell phones, Internet, clothing, transportation, home, charity, insurance, and even unexpected events based upon random card draw. Volunteers from across the county help the day progress through four groups throughout the day. Gilmer Family Connection Director Merle Naylor, who organizes the event, told FetchYourNews it’s the volunteers she relies on to make the day happen. Allowing students a glimpse of the general is what she points to as the real meaning of the day, but she also enjoys the time for citizens to volunteer showing that the students matter and are worth the time taken for the day. 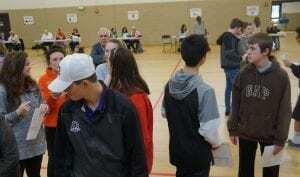 Sophomores from GHS prepare for Reality Day with friends at the Ellijay Civic Center. Naylor went on to note that she takes a lot personally from the day to know that people are willing to volunteer for the project. The interaction with the students goes a long way, but more, the interaction with each other builds the community support of the students and of each other. Be sure to check out FYN’s Facebook page for more photos from Reality Day 2018. 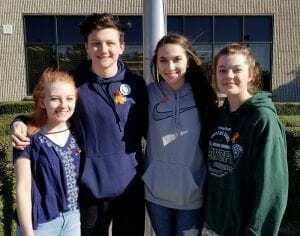 ELLIJAY, Ga. – With a nationwide “walk-out day” today, Gilmer County saw its own high school students leaving class and marching onto the front lawn in remembrance of 17 dead last month. However, those attending the walk-out glimpsed a different side of these students than many may have expected. There was no chanting, no loud shouts of political ideals. Instead, somewhere close to 50 students stood in 30 degree weather silent, remembering the 17 dead. A short speech by two freshmen, Justin Gooch and Jordan Henderson, set the tone for the 20 minute walk-out. More than a tone, though, they stood to become a voice of those 50 gathered. As seen in the video, Gooch told his classmates about his hope to change his school to a “more welcoming environment.” The voice rang through the crowd as others stood to echo his sentiments, including one student, who called himself J.B., that stood on the bench to say “we are all the same.” It was 20 minutes of high school students telling each other what they could do to change things, and how they could be different in today’s time. Junior Grace Kruse commended those in attendance for their bravery in standing up for the change they wanted. She told her fellow students to be proud of themselves. From left to right, freshmen Jordan Henderson and Justin Gooch and juniors Ashlyn Jenkins and Grace Kruse led today’s “Walk-out” through moments of prayer and prepared speeches. Kruse repeated her thoughts after the event saying that she wanted to encourage her generation to use their voice, a loud voice that proves a difference from the common belief that they, as a generation, do not care. Jenkins told FYN that today meant there is a chance for our nation to change, seeing so many young people willing to stand up for something. It is a feeling of hope for their generation. The feeling continued along with students saying they did not expect so many people to attend the walk-out. Gooch said he knew he was going to walk out of class regardless of the possibility of being the only one, but seeing over 50 people on the front lawn was encouraging after only seeing four people walk out of his own class. “I see the change proving that most people do care … They want us to have a better environment,” Gooch stated. The idea of the movement in Gilmer focused on changing their environment to stop bullying and ostracizing those who may have mental illness. They passed around ribbons to wear. Gooch told FYN the conversation they are trying to have is that the reason that most of these things are happening is bullying and pushing kids to these limits. Though those present said there is a point later to talk about policy and/or gun control, they wanted today to be about human life and the importance of life, the importance of growing closer together. Kruse stated she wanted today to be about the 17 people who died, and the numerous more in other shootings. The students noted a plan spreading through the nation about a potential march on Washington D.C. For today, however, these students say they do not want this to stop here. They hope there is more in Gilmer County. As they filtered back through the doors to return to their classes, they told FYN that they want a next step on this path to make their school better, they want a next step to make themselves better. 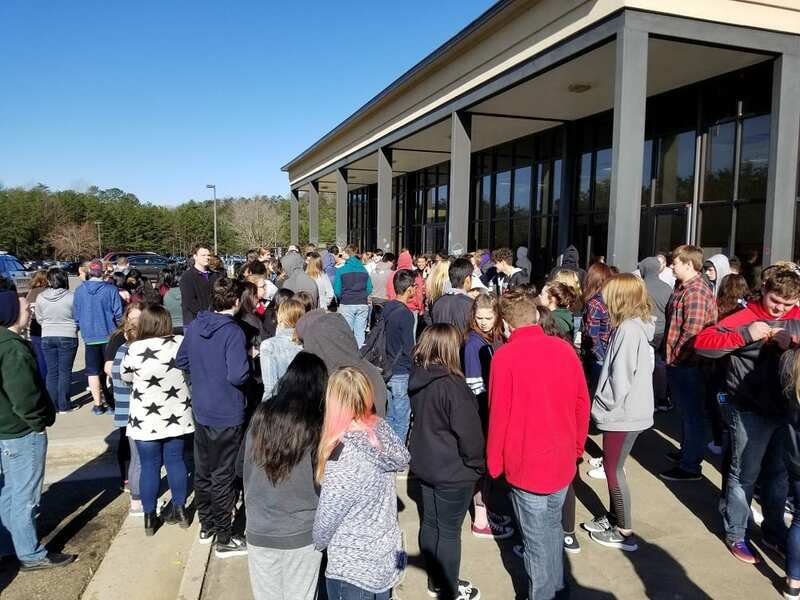 Students gather in front of Gilmer High School for a “Walk-out” March 14, 2018.